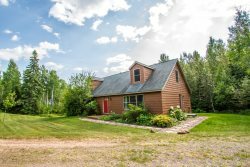 Beautiful private location on Lake Superior's shoreline in the heart of the quaint town of Tofte. Great cabin with a great location. Amazing lake-facing deck offers lots of room for sunning and BBQs. Take an afternoon nap in the seasonal hammock while you listen to sounds of Lake Superior’s waves splashing against a private section of shoreline just a few yards away. On a warm summer evening prepare a meal to enjoy on the deck using the charcoal grill. Then cap off the night with a bonfire on the beach and roast up some marshmallows. With 2 bedrooms, 1.5 bathrooms plus a sleeper sofa in the loft, this home can comfortably accommodate the whole family or a group of friends heading north for a ski or hiking trip. With its combination of wood paneled walls, hardwood floors, and wood stove it has the feel of a traditional north woods cabin retreat. Warm and cozy for the winter months and on a great bit of land to enjoy the great outdoors in the summer months. The home also has easy access to 300 feet of ledge rock beach, perfect for watching the sunrise and sunset. It's convenient Tofte location is near snowmobile trails, hiking, golfing, biking, skiing and more. Superior National State Park hiking trails, Oberg Mountain, Sawbill Trail (Sawtooth Outfitters and rental ½ mile away), Gitchi-Gami Bike Trail, Tofte Park (with Lake Superior boat launch), Superior National Golf Course, Lutsen Mountains Ski and Recreation Area, and Temperance River are a few of the attractions just minutes away, making this cozy cabin a great, central location for your next North Shore vacation. The cabin is also located less than a mile from Bluefin Grill and The CoHo Cafe for your dining pleasure, and just a short drive to Lutsen Resort and Caribou Highland Resort, both full menu restaurants. The Tofte General Store is just down the street for those items you forgot to bring. Grand Marais is just 30 minutes up the road with dining, shopping, and the head of the picturesque Gunflint Trail. Come and enjoy everything the North Shore and this beautiful home have to offer. Allergy Warning: Guest with pet allergies should be aware that while this property is NOT a pet-friendly rental, however, the owner has a pet and there may be some hair/dander present. It was nice to get an email to be sure we had arrived. and you responded to my question quickly. The house is comfy, the kitchen had all the equipment we needed, and everything worked. The location - overlooking the lake - is fabulous. Morning Light was exactly what I had expected regarding an adorable and comfortable cabin with amazing views of Lake Superior. It was the perfect place to come back to for the night after hiking all day and visiting some of the local towns in the area. Your team was great as usual! Very friendly and helpful. Working with Cascade has always been great...everyone is very helpful and friendly...no issues at all. Always good customer service. The properties are beautiful. Clean house with ample room. Location was wonderful and easy to find. Over the past 4 years i havent had to deal with many Cascade staff members, but those I have were polite and quick to respond. This cabin was perfect for our group. Weve rented from Cascade 4 times before. While all properties were nice, this one had the best combination of location, cabin comfort, and access to the lake. Second time staying at Morning Light, and would definitely recommend it to anyone looking for a great place to relax and unwind. Perfect location and everything you need it there. Service was fast and efficient. Appreciated someone shoveling the snow off deck even though it was only an inch or two. Lovely home and outstanding location. Really enjoyed ability to walk into Tofte while still having the feeling of solitude. Home was great, can't beat the view and lakeshore access. Original 80's charm in great shape. This time only email info. No complications. Excellent! Very nice cabin, no issues- we loved it. This is a beautiful cabin. Cozy, gorgeous views, perfect size. We loved the fireplace and the deck! Even though it was cold, we were able to see the stars from the deck on our first night...super clear sky! We loved it at Morning Light. Such a gorgeous view and plenty of room to spread out! Would love to see a little more lighting in the sitting area that looks over lake. And maybe directions for tv and dvd, we had to hook them up ourselves. But all in all absolutely loved it! Everyone has been helpful, respectful and friendly. A huge plus!! Morning Light is exactly what we like about a get away; being on water and in the woods. This is a retreat where we are content to spend most of our time on the property. We are minutes away from great hiking places and amazing rivers. The house is well stocked; we bring clothes and food and that is about it. We feel like we are "home" when we pull in the driveway. We rented the Morning Light cabin for a family girl's trip. We absolutely loved Morning Light! The setting and proximity to Lake Superior can't be beat. The location feels completely private, and yet there are neighbors nearby & a Holiday gas station less than a mile, which is nice to know. Unfortunately, we had less than ideal weather on our visit, so we couldn't take full advantage of the deck and shoreline - but we still enjoyed coming "home" to Morning Light after a full day of hiking and exploring. We made a fire in the wood stove on our last night, which was lovely and made up for not being able to have a bonfire on the shore. The kitchen is more than adequately outfitted with kitchen items (pans, utensils, etc) - we made 3 meals there over the weekend, and found everything we needed (and more!). We all slept well and enjoyed waking up to the Lake out our windows :) Only sort of negative is that the decor is VERY dated - I know this is common with cabins, but felt like a few small changes would make a world of difference. Also, additional comfortable seating in the cabin would be nice. There are only 2 comfortable chairs - we ended up sitting on the hard chairs at the table most of the time so we could actually sit together. Regardless, we would definitely come back and would recommend to anyone! This cabin is a must to rent some time. It has it's own private area and shore-line. Cabin was very clean and so cute. Absolutely loved it! You have been very easy to work with and we did stop into your office and book the cabin for next year....I added a day for this year and that was taken care of promptly...all in all a good experience. We loved the cabin. It was perfect for our needs. I like to read at night and stay up late but we have a child with us that needs to get to bed, with the loft bedroom they had a space and so did I. We also liked that it was so private.....just you and the wildlife...our father had owned a cabin for many years and this brought back fond memories of that....we could bring in our own food and cook if we wanted to or go out....also it was easy to go up to Grand Marais which is a favorite place for us....all around just a great place. I have called and received excellant service. Perfect location, super cabin! Loved it! Did not have any contact with Cascade staff, everything was perfect start to finish and no need to contact during our stay. Our stay at Morning Light Cabin ranks up in the top two "best vacactions" ever. The location was perfect, the quiet and solitude was exactly what we were looking for. The cabin and furnishings are older but still functional and had no complaints. A lovely property. Great view and private setting.